At K R Electrical, we have based our business success on providing the services you need, along with first class customer service. We are fully qualified, NICEIC contractors and part of the Trustmark scheme, meaning you know you can trust our work. All jobs, large or small, receive the same high level of care and attention from our team of skilled electricians. We always treat our customer’s homes with respect and work in a clean and tidy manner at all times. We carry out a comprehensive range of electrical work. From small jobs such as replacing a damaged socket to complete redesign, new installation and refurbishment. Whether you need us to replace a broken light fitting or rewire a faulty lighting circuit, you can rely on us to provide fast and professional service. We can repair any electric lighting system as well as install any new lighting systems you may require in your home. We can even carry out stylish lighting makeovers for your home, supplying and installing a range of lighting solutions, including spotlights, wall lights, LED lighting and mood lighting. If your home has inadequate electric sockets and you often rely on extension cables to power appliances, then you may be dealing with tripping fuses. In extreme cases, this scenario can result in dangerous electrical fires. But our expert electricians can install new or additional sockets, keeping you and your appliances safe. We can even install external weatherproof sockets, armed with an emergency cut-out, to operate your outside appliances. At K R Electrical we’re always looking for ways to help our customers reduce their costs. Switching to energy-saving lamps not only saves you money, but also has a positive long-term effect on the environment by reducing overall electricity use. Compact fluorescents (CFLs) – a cost-effective option for most general lighting purposes and widely available. LED lamps– a higher efficiency than CFLS, and the ideal replacement for halogen downlights. Are your household electrics tripping for no apparent reason? Whether you have an issue with damaged plug sockets or faulty wiring on your lighting circuits, you can rely on our qualified electricians to pinpoint the source of the fault quickly and efficiently. Once the fault has been identified, we can advise you on the best course of action, then carry out any necessary repairs. A simple period inspection regime can make sure your electrics and portable appliances are in safe working order, and reduce the risks associated with electrical faults. Do you suspect there may be a fault with your home’s electrics? Many electrical problems are often caused by issues with internal wiring, fuse boards or circuit breakers. Fortunately, our highly-qualified electricians are experts in inspecting domestic electrics, and can identify potential faults quickly and efficiently. We can supply and fit new fuse boards where necessary and can repair and rewire faulty internal wiring, ensuring your home is left safe and worry-free. There are many dangers associated with faulty electrics: risk of electrical fire, electrocution and potentially fatal accidents to name but a few. We therefore always advise having your household wiring inspected to make sure it is compliant with building regulations and current safety standards. Whether you need a new consumer unit or just a spot of simple rewiring, our expert electricians can advise you on the most cost-effective and affordable course of action. Older properties may have electrical infrastructure that isn’t fit for modern demands, but may also not benefit from the added safety mechanisms of modern systems. 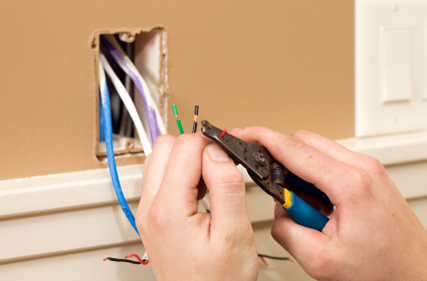 Get in touch to find out if your house has dated wiring that needs replacing, and to learn more about the advantages of updating your home’s wiring. Many appliances such as boilers, showers, electric ovens and electric water heaters often require more complex cabling, fusing and wiring to safely carry the additional load required by the appliance. Fortunately, when it comes to assessing an appliance’s electrical requirements and making any necessary changes to your home’s electrics, our highly experienced electricians are the people to call. We can arrange a visit to coincide with your appliance’s delivery. Call us now to book your appointment.